It is generally held that there are three main options available to Brexit negotiators to settle our trading relations with the EU: the Efta/EEA Option (often known as the Norway Option); the bilateral free trade (or bespoke) option; and the so-called WTO Option. Although we have looked at this WTO option and its potential consequences for the UK, many times, the complexity of the systems involved suggest we need to look at it in even more detail. Firstly, though, it is necessary to define what is meant by the WTO Option. This is taken to be a scenario where, for whatever reason, the UK eschews any form of trading agreement with the EU and trades solely and exclusively within the framework set by the diverse WTO Agreements. This might occur by design (even though this is unlikely) with the UK deciding not to conduct negotiations with the EU, or by accident. The accidental scenario is conceivable, arising in the event that the UK fails to secure a negotiated Article 50 settlement within the two years initially allowed by the Article, and then fails to get an extension of time. In this event, the EU Treaties cease to have an effect and the UK is forced to trade with the EU on the basis of WTO rules. It must be said, and strongly emphasised in this context, that the WTO Option is an absolute. Some commentators advocate relying on the WTO rules to provide a basic framework, while additionally brokering side-agreements with the EU to cover areas of specific interest to the UK. There may or may not be merit in such arrangements but point has to be made that these are not the WTO Option. Confusingly, some have used the description "WTO plus" – but this is already applied to new WTO entrants who are required to undertake Protocol commitments that are more stringent than those of original WTO Members (known as WTO-plus commitments). Others have suggested the term "beyond WTO" but, whether this or "WTO-plus" is considered, the essence – as Pascal Lamy has pointed out – is that in each bilateral free trade agreement we have the "WTO plus" provision". It is best therefore, when referring to the WTO Option, to use a definition that excludes any other form of agreement. The acceptability of the WTO Option is often justified by reference to other nations which supposedly trade with the EU without the benefit of bilateral trade agreements. Advocates cite the United States, Australia and China, which are assumed to be operating under WTO rules. Such assumptions, however, are flawed – resting on an unduly narrow interpretation of a trade agreement (or, technically, a regional trade agreement) as one which concerns tariff reduction and which is notified to the WTO and held on their databases. Trade agreements which do not deal specifically with tariffs are not notified to the WTO but are instead held on the United Nations treaty database. Although regulatory cooperation forms a major part of any comprehensive free trade agreement, and the OECD identifies eleven categories of agreement involving what is known as "International Regulatory Cooperation" (IRC), only one encompasses the traditional trade agreement and is thus notified to the WTO. The countries cited as having no trade agreements with the EU do in fact have multiple agreements with the EU – although none of them are notified to the WTO. They cannot in any respect be regarded as operating exclusively under WTO rules and cannot be held as examples of the WTO option. This is especially the case with the United States which has its own State Department declare: "The United States and the 28 Member States of the EU share the largest and most complex economic relationship in the world". Transatlantic trade flows (goods and services trade plus earnings and payments on investment) averaged $4.3 billion each day of 2013. On the European Commission's Europa website, there is the Treaties Office Database which boasts an advanced search facility. Search by "country" (United States of America) and "nature of agreement" (trade agreement) and the database will list 23 agreements. Under the category of "Agreement for trade and cooperation", there are a further eight agreements, in particular the 1976 Framework Agreement for commercial and economic cooperation between the European Communities and Canada. This is described as a "non-preferential agreement" and the very first formal agreement of its kind between the EEC and an industrialised third country, under which the parties committed "to develop and diversify their reciprocal commercial exchanges and to foster economic co-operation". With this and the categories, "agreement on Customs Matters" - an issue which is intimately trade-related - "Agreement on internal market matters", there are recorded 38 EU-US "trade deals", of which at least 20 are bilateral. A similar exploration of China's status with the EU identifies multiple agreements - 65 over term, including 13 bilateral agreements, ranging from trade and economic co-operation to customs co-operation. None of these agreements are of the simple, tariff reduction variety, but collectively they have enabled China to become the EU's second largest trading partner, with trade valued at over €1 billion a day. So many other countries have their own trade deals with the EU that it is difficult to identify countries which do trade solely under WTO rules – there are so few of them. One cannot even cite North Korea, ranking 182 as an EU trading partner, as this is not a WTO member. Altogether, the EU has 880 bilateral agreements with its trading partners, and there is no example of a developed nation trading with the EU solely by reference to WTO rules. For the UK to trade with the EU relying on the WTO Option would be unique for a developed nation, creating an unprecedented situation. Because it is a unique event, it is not possible accurately or completely to define the entire range of consequences arising from the UK dropping out of the EU Treaties, with no replacement agreements, relying solely on WTO rules. That is an issue in itself, as the prospect raises considerable uncertainties. Of the known knowns, however, one significant fact is that the EU's Customs Union is an exclusive EU competence. This means that Customs law - which provides the legal base for, and defines, the procedures adopted by officials to regulate the flow of goods (and some services) in and out of this country - is framed exclusively by the European Union. This law drives an EU-wide system that handles 17 percent of world trade – over two billion tonnes of goods a year with a value of €3.3 trillion. Between 2004 and 2010, despite the impact of the financial crisis, the value of EU external trade had grown by almost 50 percent. The EU is at the centre of global trade and supply chain logistics, and is the number one trading partner for the United States, China and Russia. More than 90 percent (8.4 billion tons of merchandise) of global trade is carried by sea, of which more than 20 percent is unloaded in Europe. The EU has over 250 international airports. The eastern land border runs to almost 10,000km with 133 commercial road and rail entry points. Taking into account the entire EU external border (land, air, sea) there are in total more than 1,000 customs offices of entry. In 2011, EU Member State customs processed 36 million pre-arrival cargo declarations, 140 million import declarations, 96 million export declarations and 9 million transit declarations. These figures represent an average of 8.9 declarations per second handled by the Member States' customs administrations. They collected customs duties that contributed an estimated €16.6 billion to the EU budget, i.e., approximately 13 percent of the total. In settling for the WTO option, the UK will be, whether by accident or design, embarking on a course of action that will cause significant damage to this system, and render it inoperative in the UK. As far as the UK goes, the problem would then be that there would be no Customs law at all.The entire body of law has been replaced by the EU acquis, known as the Union Customs Code (UCC) legal package. It comprises the Union Customs Code itself, adopted on 9 October 2013 as Regulation (EU) No 952/2013 of the European Parliament and of the Council. This entered into force on 30 October.2013 although most of its substantive provisions apply from 1 May 2016. It also includes the UCC Delegated Act, which was adopted on 28 July 2015 as Commission Delegated Regulation No 2015/2446. It contains certain non-essential elements of the UCC. Then there is the UCC Implementing Act, adopted on 24 November 2015 as Commission Implementing Regulation No 2015/2447. This is required to ensure the existence of uniform conditions for the implementation of the UCC and a harmonised application of procedures by all Member States. Two other measures then complete the basic package. One is the UCC Transitional Delegated Act, adopted on 17 December 2015 as Commission Delegated Regulation No 2016/341. It establishes transitional rules for operators and customs authorities pending the upgrading or the development of the relevant IT systems to create a fully electronic customs environment. The other is the UCC Work Programme, adopted on 11 April 2016 as Commission Implementing Decision No 2016/578. It relates to the development and deployment of the electronic systems provided for in the UCC and is closely linked to the UCC Transitional Delegated Act. The point to be made here is that this body of law has emerged in its present form over many decades since its inception in 1968 and currently comprises over 1,300 pages. As regulations and decisions, the law has direct effect but, with UK independence, would cease to have any legal effect in the UK. To rebuild a Customs code in the UK, the elements which were applicable to the UK (and within its jurisdiction) would have to be replaced, starting from scratch. As an emergency fix, some of the EU law could be re-enacted. But considerable adaptation would be needed. This would be a complex and time-consuming process and, assuming that the UK had lost Union law as a result of the expiry of the Article 50 process, this would be an unplanned event, requiring officials to work at speed under less than optimal conditions. No doubt a series of emergency orders could be rushed into place but, during the period when new legislation was being produced, there would be no legal code applying to UK Customs operations. Temporary measures aside, it is difficult to see how a comprehensive code could be quickly or easily replicated, even if there were the personnel available with the necessary skills and experience. This might be further complicated by certain aspects requiring Union and international recognition - especially the mutual recognition of Approved Economic Operators (AEOs) and the mutual recognition of conformity assessment. Nor is it necessarily the case that the resultant system could be fully functional at an operational level. Without ongoing agreements to ensure continued cooperation, UK Customs authorities would be cut off from risk management and other databases, and previously shared systems for communication and information exchange. On this basis alone, the result would inevitably be serious perturbation to the Customs system and the management of traffic flow at the borders and UK ports. 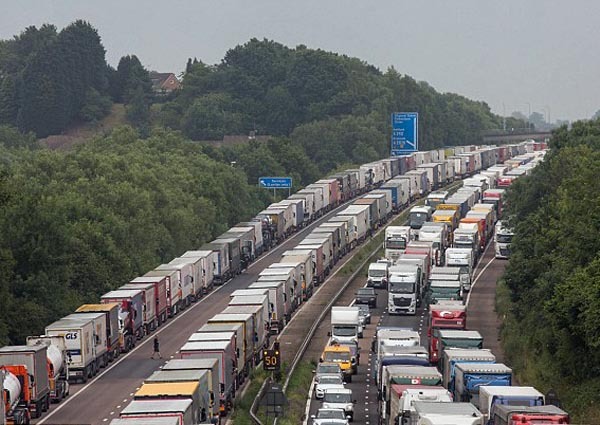 As I have remarked before, within a week, Operation Stack could have reached Leeds, as the disruption spread. This will not because anyone wanted it or intended it to happen. It will be in the nature of an accidental crisis, not so very different from the scenario which brought the First World War into being, where the troops were mobilised and there was no means of turning back.